Published: Apr 4, 2017 · Modified: Apr 12, 2019 · By Jen Sobjack · This post may contain affiliate links. 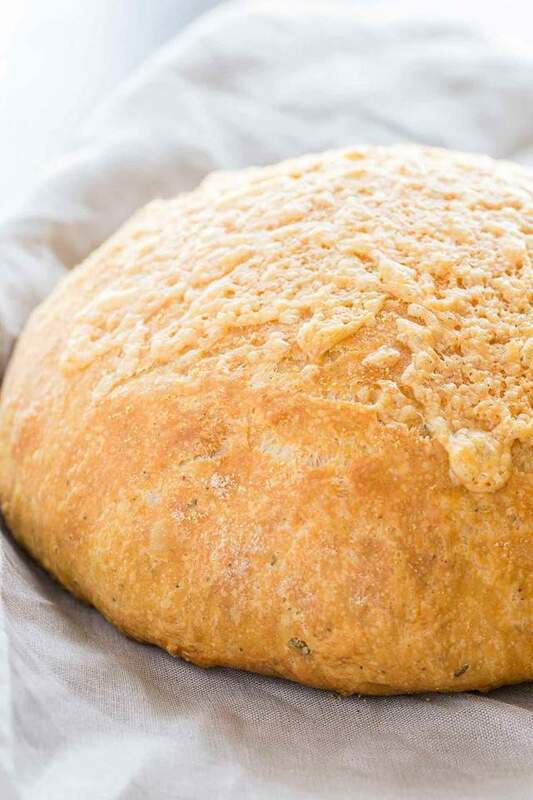 Nothing is better than flavorful Rosemary Cheese Bread baked in a Dutch oven. This simple no-knead recipe requires very little effort. Mix the dough the night before you plan to bake the bread and let it sit on the countertop overnight. Shape it and let it rise for two hours then bake it in a piping hot Dutch oven. 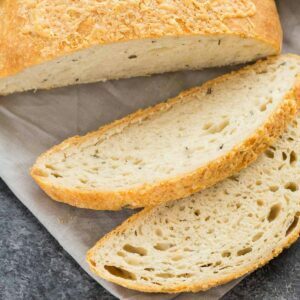 This is one yeast bread you are sure to love time and time again. This is a sponsored post written by me on behalf of Red Star Yeast. I adore yeast bread and thoroughly enjoy working with it. Plus, the smell of fresh bread baking is just amazing! It’s one of the most pleasurable baking experiences. You can find several yeast bread recipes in the archives but some of my favorite are these buttery jam biscuits, slow cooker bread, and rosemary olive beer bread. Today’s Rosemary Cheese Bread is actually adapted from the beer bread. I swapped out the beer for water, added Gruyere cheese, black pepper, and left out the olives. I’m so happy with the result! Keep in mind this recipe requires an overnight rise and a second rise just before baking. Be sure to plan ahead. Baking the bread in a Dutch oven will give the exterior a crunchy crust while the inside is moist and tender. The Dutch oven does need to be hot when you put the bread in. Set it in the oven with the lid on and preheat the oven while the dough is on its second rise. This will ensure that you do get a crunchy crust on the outside. I like the no-knead method for making yeast dough because it’s practically no fail. As long as your yeast is fresh and alive, you will have success. This is the reason I use Red Star® Active Dry Yeast. It never fails me and is perfect for all types of yeast dough. Successfully baking this Rosemary Cheese Bread will be one of the most rewarding experiences. The smell of it baking, the taste of gooey cheese and rosemary, and the fact that you made it completely from scratch is totally satisfying. 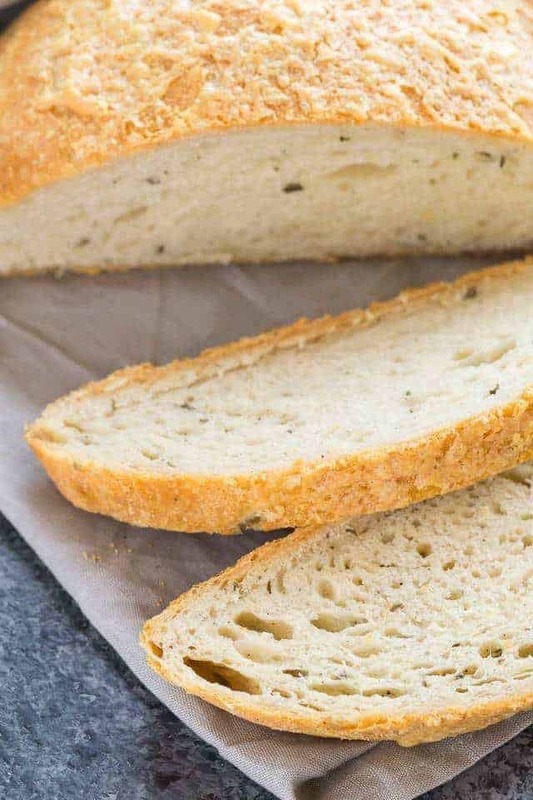 Make sure to use bread flour when making this recipe. The extra gluten proteins in the flour will help in the no-knead process. 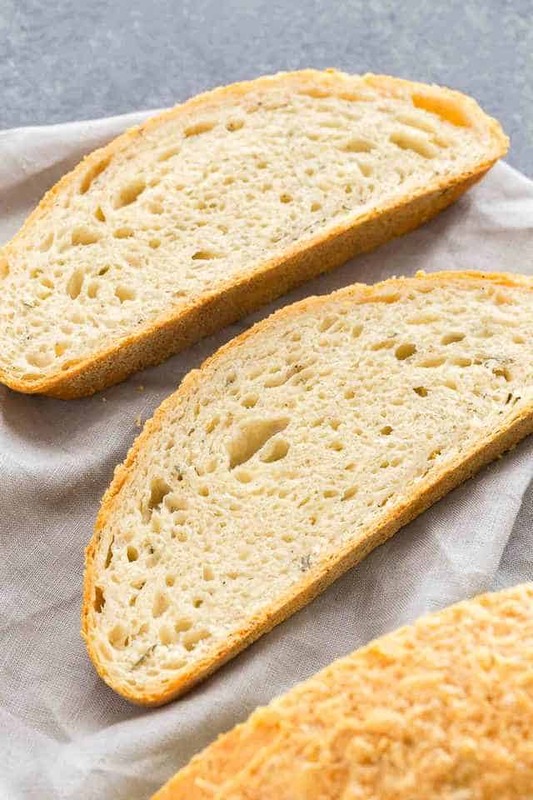 Mix the flour with salt, yeast, Gruyere cheese, fresh rosemary, and black pepper together in a large bowl. Remember to place the salt and yeast on opposite sides of the bowl because salt will kill yeast if it comes in direct contact. Once you mix it all up, stir in warm water. Use a wooden spoon for this because it’s sturdy and you’ll need a strong stirring utensil. Keep stirring, with a little arm strength, until the dough comes together in a ball and no longer sticks to the side of the bowl. Place plastic wrap over the bowl and let it sit on the counter for at least eight hours and up to twenty-four hours. When you are ready to bake the bread, turn the dough out onto a lightly floured surface and flatten it into a disk. Fold the disk over onto itself and shape it into a ball. Place it in a lightly greased bowl that is smaller than the Dutch oven you’ll be using. Cover and let rise for two hours. While the dough is rising, heat the Dutch oven in a 450°F oven. Once the dough has risen, take great care removing the Dutch oven from the oven. Sprinkle a little cornmeal in the bottom and carefully place the dough inside. Sprinkle a little more cornmeal over the top. Return the lid to the Dutch oven and place it back in the oven. Bake the bread for 30 minutes then remove the lid and sprinkle more cheese over the top. Bake it for another 15 to 20 minutes. 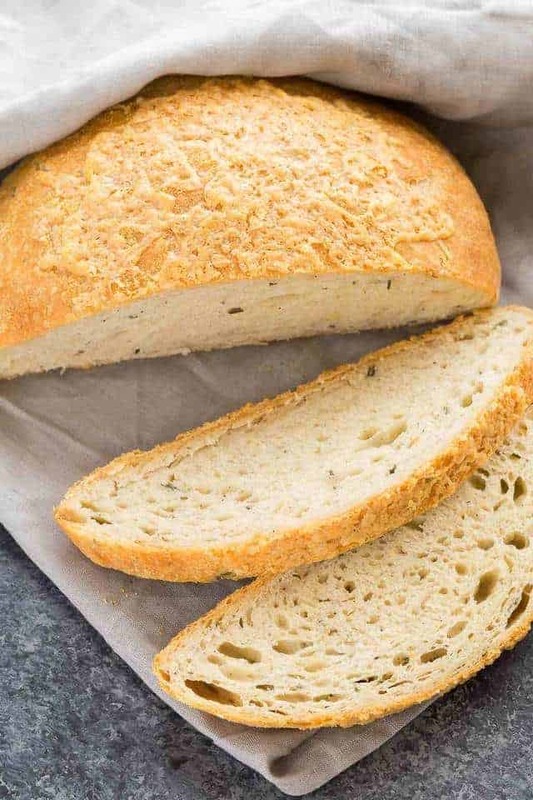 The result is a tender, crisp rosemary cheese bread that you and your family are sure to enjoy. For more recipe inspiration, follow Red Star Yeast on Instagram, Facebook, Pinterest, Twitter, Google Plus. In a large bowl, combine the flour, salt, pepper, yeast, 3/4 cup of the cheese, and rosemary. Stir with a whisk. Slowly pour in the water. Stir with a wooden spoon until well blended and the dough forms into a ball. Cover the bowl with plastic wrap and let it set on the counter overnight, 8-24 hours. Turn the dough out onto a lightly floured surface. With well-floured hands, flatten the dough into a 9-inch circle, then fold it over onto itself and shape it into a ball. Place the dough into a lightly greased bowl that is smaller than the Dutch oven you plan to bake it in. Cover the bowl with a tea towel and let rise for 2 hours or until doubled in size. Meanwhile, position the oven rack to the lower third of the oven and set a 4 to 6-quart Dutch oven on the rack. Preheat the oven to 450ºF. Once the dough has risen, remove the Dutch oven from the oven and remove the lid. Sprinkle the bottom of the Dutch oven generously with cornmeal. Carefully place the dough inside and sprinkle the top with remaining cornmeal. Place the lid on the Dutch oven and return it to the oven. Bake for 30 minutes. 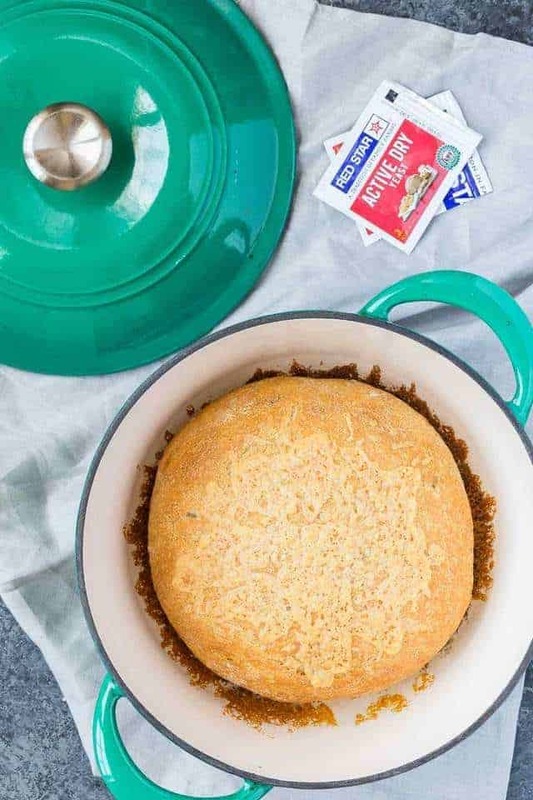 Remove the lid from the Dutch oven and sprinkle with remaining cheese. Bake uncovered for an additional 15 -20 minutes. Turn the bread out of the Dutch oven and place it on a wire rack to cool completely. Hello! I just made this over the weekend and followed the recipe almost exactly as I swapped the super spendy Gruyere cheese for parm reggiano and BOY it was delicious. I’m sure any hard shredded cheese could work, but wanted to share how delicious the parm was baked inside in addition to it being sprinkled on top. I also added about 1/2tsp more Rosemary than called for and it wasn’t too much. Thank you for sharing this recipe – I will definitely make it again and again! Ummmm….does the pepper go in with the salt? Yes, mix it in with the other dry ingredients. This sounds divine. Nothing is better than homemade cheesy herby bread. Looks fantastic!